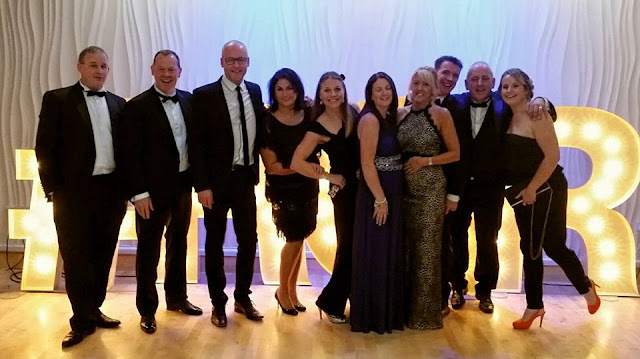 The Around The World Ball was held at The Biscuit Factory last Saturday and it can only be described as a huge success for Run Geordie Run, The Children's Foundation and The Sir Bobby Robson Foundation. The ball was hosted by BBC Newcastle's Gary Philipson and Lisa Shaw and backed by a team of volunteers from The Children's Foundation. The sell out crowd contained Lady Elsie Robson, Dr Martin Ward-Platt from The Children's Foundation, sponsors, friends, family as well as people I'd never met before. One thing I did notice was that almost everyone I spoke to knew someone from another party who they hadn't seen since school/used to work with/was an old next door neighbour of.... I could go on. It was a most unusual situation with a huge number of people seemingly connected in some way. As I later found out, Dr Martin Ward-Platt was to thank for treatment to one of my support team's family's premature baby. Gary and Lisa did a brilliant job of hosting the night and they were on very good form. It was great to see them working together again as, of course, they now have their own separate shows on the BBC. The pair's interaction with the guests was hilarious and we all had such a good laugh. You just knew that a bald man would win the posh hairdressing prize! The evening was filled with various opportunities to win prizes such as an Apple iPad Air, a Links of London bracelet, a rare bottle of whiskey, various hospitality packages, signed memorabilia and so much more. The formalities kicked off with a reminder of why we were all there. The following video was shown. After a hilarious version of Heads and Tails, we tucked into a specially designed 3 course meal with hints of Chinese, French and Turkish cooking. The food was by far the best I've ever had at an event of this size. The feedback we've had since has been in keeping with my thoughts. A huge well done to the Biscuit Factory. 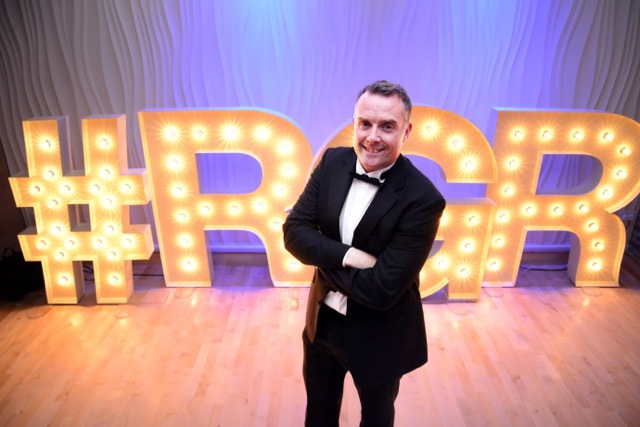 I've got to say that this came as no surprise as the Ball Committee were fully aware of what the venue was capable of. I addressed the audience after dinner and spoke of my motivation for running around the world and what the charities meant to me. This part of the evening also allowed me to say thank you to my support team, sponsors and of course Donna. Before the auction started, the following video was shown. Our auction raised a huge amount. There were some tremendous bids for our very impressive line up of goods donated by SOS Group Ltd, Jury's Inn, Virgin Money to name but a few. The final part of the evening saw local band Tiny Afro take to the stage to entertain the guests with hits from The Jam, Killers, Kings of Leon and many more. The final total raised on the night was a very pleasing £8,223.17. Thanks to everyone who attended and gave so generously. 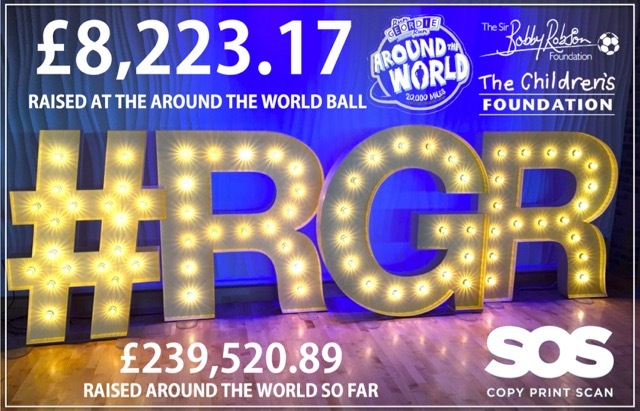 The Around The World Ball helped to get the overall Charity Fund very close to the landmark of a quarter of a million pounds. After 11 months of fundraising, the total for the European campaign currently stands at £27,082.49. 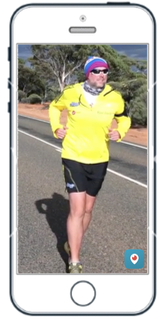 It took me until day 52 of the run across Australia to hit that figure! Thank you to everyone for their continued support. We are already looking forward to the next Ball on October 8th 2016 to celebrate reaching Istanbul and the half way point around the world. Watch this space at the end of October for details of how you can buy tickets at a special early bird price. In the meantime, photos from the Around The World ball can be viewed below. 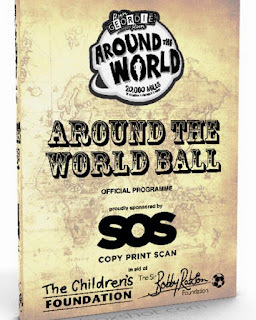 I'm pleased to announce that there are no tickets left for the Run Geordie Run "Around The World" Ball. The fundraiser, in aid of The Sir Bobby Robson Foundation and The Children's Foundation, will take place at The Biscuit Factory in Newcastle on Saturday October 10th 2015 from 6pm. We are honoured to have as our special guests, Lady Elsie Robson and Dr Martin Ward-Platt from the charities. The ball will be hosted by BBC Radio Newcastle's Sony Gold Award winning duo Gary and Lisa and musical entertainment will be provided by the superb party band; "Tiny Afro". There will be the usual host of games, raffles and auctions. Although many of them with a twist and not your usual charity ball fare. Previous attendees will know that the quality of the food at The Biscuit Factory is second to none and we have created a unique "Around The World" themed menu. 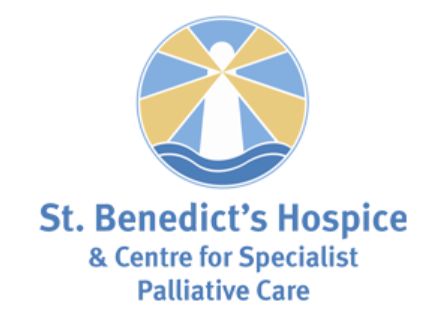 The charity fund is currently hurtling towards the quarter of a million pound mark. 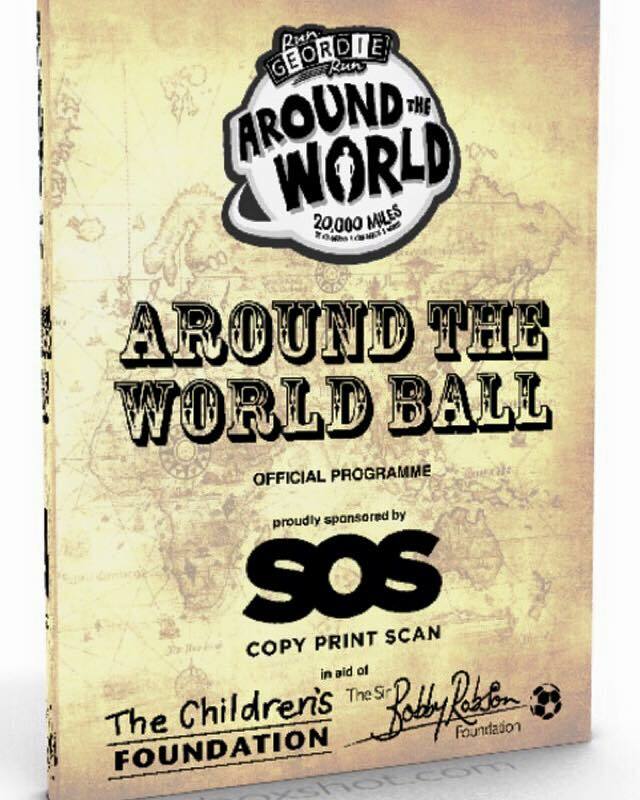 It will be interesting to see how close we can get to it on the evening of the Around The World Ball. The last Run Geordie Run charity ball in 2011 was a complete sell out and I can't thank everyone enough for making this one a success too. If you're lucky enough to have a ticket, I'll see you next week for a fun filled evening of fundraising. Sales of Run Geordie Run t-shirts have raised over £25,000 since they first went on sale in 2009 for local good causes. I'm pleased to announce that there is now a new one available to buy in aid of The Children's Foundation and The Sir Bobby Robson Foundation. Following on from the recently sold out Europe t-shirt, this latest design, by Dave at Shenton Creative, commemorates the 3rd of my 8 segments of the run around the world; Australia. The design, printed on technical fabric (ideal to wear in the gym or out running), proudly carries The Children's Foundation and Sir Bobby Robson Foundation logos as well as the Run Geordie Run Around The World logos on the front. The rear of the t-shirt shows the 2384 mile route across Australia from Perth to Shellharbour. T-Shirts are £12 each. Thanks to my sponsor Chapman Ventilation for paying for production of the t-shirts, ALL PROCEEDS from t-shirt sales will go to the Sir Bobby Robson Foundation and The Children's Foundation. 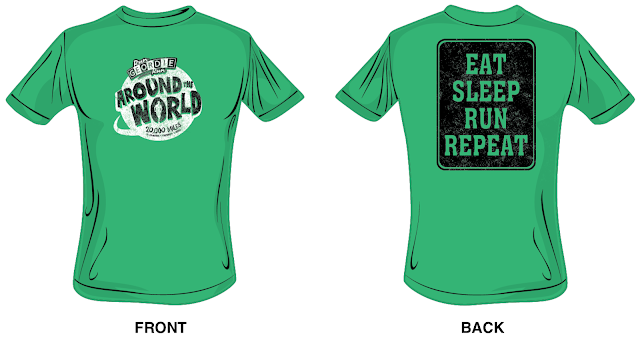 Look out for similar designs in the future for each segment of the run Around the World. In the meantime, commemorative Australia technical t-shirts can be ordered below. I'm very pleased to report that with just less than 8 months to go until the run across Europe starts, I now have a full support team. It's a hugely strong team of individuals from many different walks of life. Amongst the ranks we have a software tester, company director, forensic scientist, podiatrist, project manager, personal trainer, sports therapist, software developer and both current and retired police officers (including a 1st responder). It's a mixed bunch but a quality bunch. Of that I'm sure. 5 of the 15 strong team have previous experience on tour. Carlton and Dave were with me in the USA and Australia. Donna and Jason were with me in Australia. Steve was with me in the USA. I spent approximately 15 hours over the recent bank holiday weekend working on the support team plan for Europe. 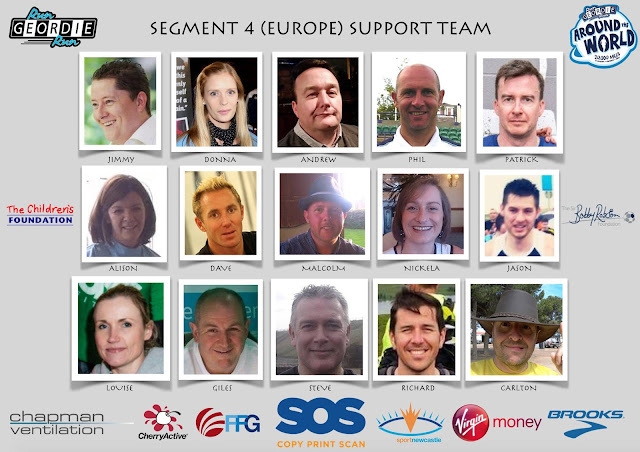 This involved putting support team names against each day of the run across Europe. One moment saw me working on the plan and another saw me contacting each of the team to check and double check their availability. Since the plan was created things have really fallen into place. I only had 11 team members at the time so there were a few "tbc" in the plan. I'm very relieved that the plan contains the full compliment of 15 names. There will be 2 people on the team at any one time and the support rota is as follows. The run starts in Lisbon with Jimmy and Donna on duty. They will see me all the way to the Spanish border at Vigo where Andrew and Phil will take over. Patrick will take over from Andrew and join Phil in Dijon. They will then both leave the tour in St Jean Pied de Port when Alison and Dave will see me through the Pyrenees to Andorra. Malcolm and Nickela will then take over and hand over to Jason and Louise on Mont Ventoux. Giles will join Louise and take over from Jason in Turin. They will stay on the tour until Munich where Steve and Dave (for a 2nd stint) arrive. Phil will arrive for a 2nd stint with Richard in Ljubljana, Slovenia. They will take over from Steve and Dave. Donna and Carlton will then take over in Belgrade and will be joined by Jimmy for a 2nd stint in Sofia. The 3 of them will stay on the tour all the way until the finish in Istanbul. They will be joined by Andrew for a 2nd stint in Greece. Donna will fly back to the UK the day after the run finishes and it will be up to Carlton, Andrew and Jimmy to drive the RV to Amsterdam before we set sail for Port of Tyne! Phew! I hope you kept up there! I'll talk more about the individuals in the team in the coming months. 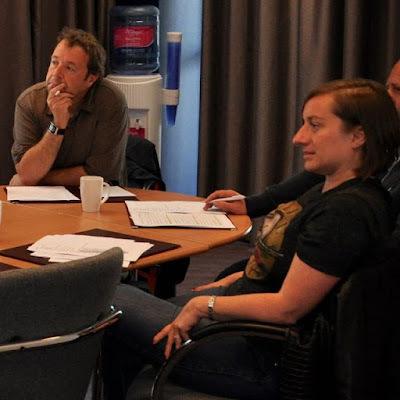 In the meantime, I'm looking forward to getting the team together on the 27th September for our 2nd team meeting at The Jury's Inn on Gateshead Quayside. 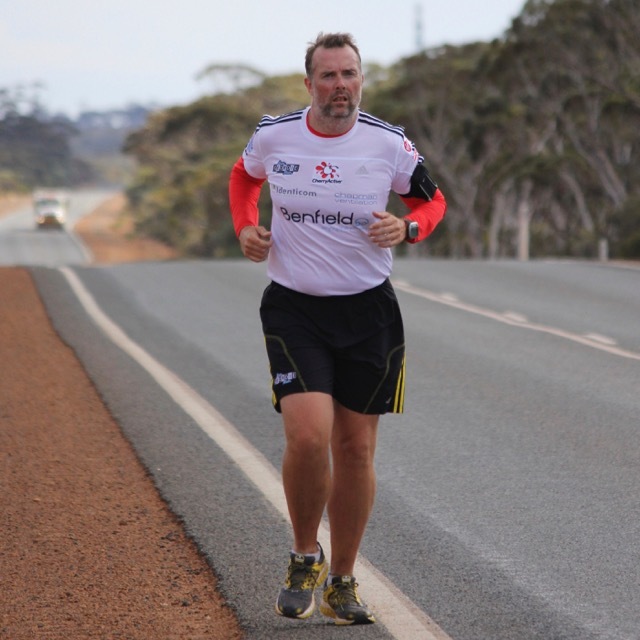 John O'Groats to Lands End (874 miles in 2007), California to New York (3100 miles in 2011) and Perth to Sydney (2384 miles in 2013) have all presented incredibly tough but rewarding charitable challenges. Those epic runs now form the first 3 of 8 segments of the run Around the World in aid of The Sir Bobby Robson Foundation and The Children's Foundation. In a little over 260 days time (1st May 2016) I'll be standing on Guincho Beach near Lisbon, Portugal; the start of the 4th segment of the run around the world. If all goes to plan I'll find myself 100 days and 3400 miles across Europe at the finish line under the Bosphorus Bridge in Istanbul, Turkey. 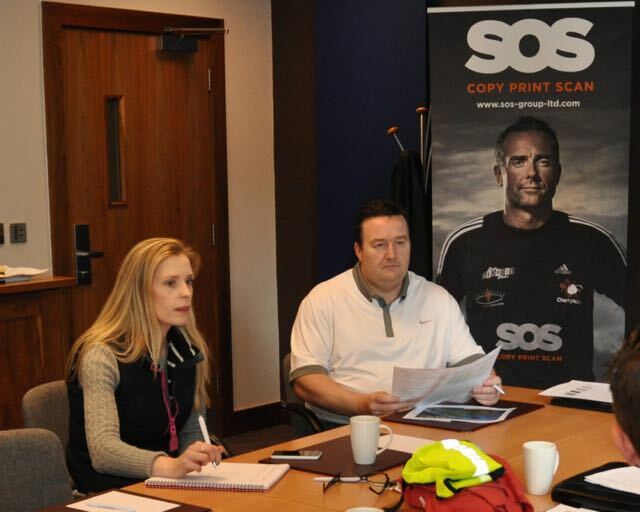 Thanks to headline sponsor SOS Group as well as Chapman Ventilation, Fresh Freight Group, Virgin Money, Sport Newcastle, Brooks and CherryActive for helping to make this next segment possible. Backed by a superb support team of unpaid volunteers I stand a fair to decent chance of completing the run across Europe in 100 days. 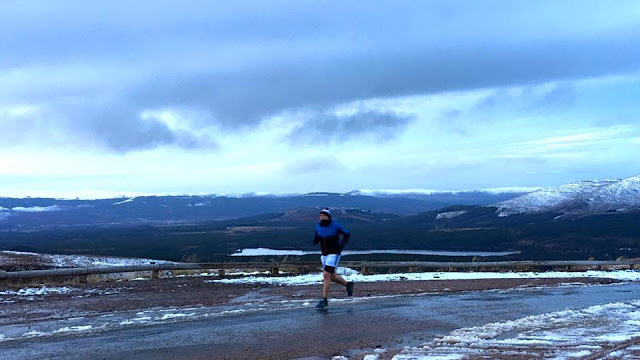 As the build up to the run intensifies, I'll be keeping the blog up to date with all of the latest goings on in the world of Run Geordie Run. Please be sure to check back regularly. You can also follow the journey on Instagram, Twitter and Facebook. 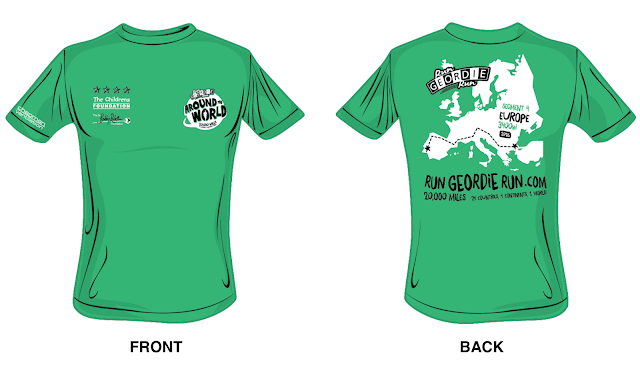 Sales of Run Geordie Run t-shirts have raised over £24,000 since they first went on sale in 2009 for local good causes. I'm pleased to announce that there are some new ones now available to buy. The first of two new designs, by Dave at Shenton Creative, commemorates the 4th of my 8th segments of the run around the world; Europe. The design printed on technical fabric (ideal to wear in the gym or out running), proudly carries The Children's Foundation and Sir Bobby Robson Foundation logos as well as the Run Geordie Run Around The World logos on the front. The rear of the t-shirt shows the 3400 mile European route from Lisbon to Istanbul. These are all now sold out! Thanks to everyone who bought one. The second design is a faded Around The World print on a premium cotton t-shirt (ideal for casual wear or at the gym). The rear of the t-shirt holds a very appropriate message that reflects all of the 6358 miles ran to date around the world. Sizes available are S, M, L.
You may or may not of heard about a new smartphone app about called Periscope. It's a video streaming app for iPhones and Android devices. I tested it out for the first time tonight with a short broadcast. I was pleasantly surprised at how many followers I already had (99). Of those, 30 or so tuned in to my very first Periscope broadcast. Mobile signal permitting, I'm going to look to use Periscope in the build up to and during the run across Europe. Being able to broadcast the start of the run from Lisbon, perhaps a scenic section in the Alps or the dramatic finish in Istanbul is truly a mind blowing thing. It's going to help take people on the journey in real time from the comfort of their smartphone. The mock screen shots above are ideas of other uses. Alison Meldrum's treatment at the Cradlewell Clinic, Carlton emptying the RV waste, live coverage of me running and perhaps a special live broadcast of "Ready, Steady, Cook ... with the support team" could feature. In preparation for these "exciting" broadcasts why not download Periscope for iPhone or Android and follow @rungeordierun. You can also view on PC/iMac here. The chances of me running 3400 miles across Europe in 100 days are currently very slim to say the least. That might sound a tad defeatist but I felt exactly the same at this stage prior to the runs across the USA and Australia. It's not all doom and gloom, however. With less than 300 days to go before the next segment around the world starts there is still time to do things that will improve my chances. The first thing I'm doing is to meet regularly with the support team. 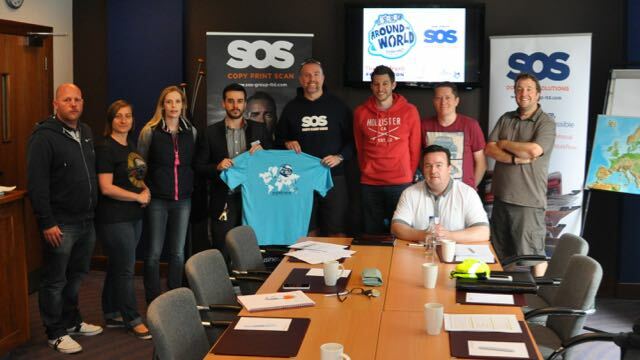 The first meeting was held recently at the Jury's Inn in Gateshead. By the time everyone on the team starts their tour of duty in Europe it is very important that they know the importance of their role, what it involves and the high and consistent standards that are expected to be maintained. 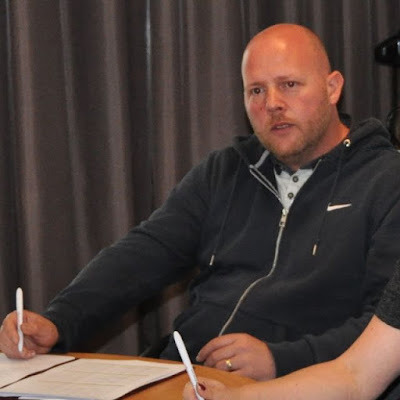 Present at the meeting were Sports Therapist Jason "Stobbsy" Stobbs pictured below (middle) with myself (left) and James "Jimmy" Childs (right). Stobbsy will put plans for his impending wedding to one side and join the tour in the French Alps during mid June. He'll really have his work cut out to keep me in 1 piece as I tackle climbs such as d'Alpe d'Huez, Col du Galibier, Col du Telegraphe, lacets de Montvernier, Col de la Madeleine and Col de l'Iseran to name but a few. Jimmy has put in a huge amount of hours in recent months refining my initial route and checking it for safety. He's added bits on here and shaved bits off there. He's got me some rest days at strategic points and increased the mileage where necessary on other parts of the route. Jimmy will be charged with driving the RV from Newcastle to Lisbon and will be present on the "kick off" team during the first week. He'll return for the final 10 days to Istanbul as part of the "anchor" team. It's a good job he likes driving as he'll also be bringing the RV back to Newcastle from Istanbul. Jimmy has also recently started jogging in an attempt to get fit enough to accompany me for a few miles. Also in attendance at the meeting was my wife Donna pictured above with Andrew Skelton. Donna will ensure everything runs as smoothly as possible from Run Geordie Run HQ in the UK before joining the "anchor" team for the final 2 weeks. Donna will liaise, where necessary, with the relevant consulates across Europe, carry out numerous social media duties, act as account manager during the run with the various sponsors and basically fix anything that requires fixing. The buck stops with her on most things away from actual running. Andrew will be joining the team at various points still to be decided in Europe and will be driving the RV, cooking, cleaning and keeping me company with a few miles here and there. Those jobs may not sound as important as say Jimmy's route planning, Stobbsy's sports therapy or Donna's logistical duties. Make no mistake, they are just as important! As has been proven in the past, any weak link in any aspect of the support team and life becomes very difficult on the road and the chances of success decrease. Like Jimmy, Andrew has also recently started jogging in an attempt to get in shape and help me get through some miles. 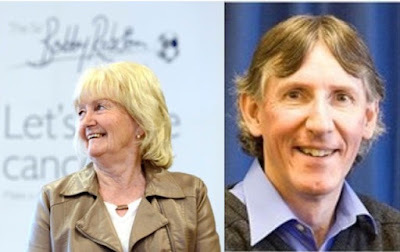 Malcolm Nichol (pictured above) will be joining the tour with his wife Nickela (pictured below right) probably in the Pyrenees. These 2 are a very positive and outgoing couple and their motivation during the tough mountainous stages will be of vital importance. Carlton Fletcher (pictured above) completed the list of attendees at the meeting. Carlton will be on the "anchor" team with Donna and Jimmy. His previous experiences of the run across the USA and Australia will no doubt stand us in good stead. Carlton is an innovative thinker and is almost certain to provide maximum comedy value which will help when the going gets tough. I was 4.5 days behind schedule with only 14 days left of the run across the USA when Carlton joined the team. We lost a further 16 miles but clawed back a whopping 148 miles while Carlton was on duty in the USA. He's the obvious choice for the final 2 weeks in Europe along with Donna and Jimmy. Not in attendance were Mark, Rachel and Richard. I'll talk more about them and their roles on the team in the coming months. In the meantime, thanks to the manager (pictured with us above) of the Jury's Inn, Gateshead, for letting us use the brilliant meeting room facilities. I arrived home tonight from the gym with this very special and unique gift from Donna. It's the kind of thing that I'll be able to look at and a million memories, good, bad and horrifically tough will be triggered. It's one of the most amazing things I've ever seen. It will have pride of place somewhere where I can glance at it from time to time and reflect on what turned out to be a most incredible journey that took me to the brink both physically and mentally. With only 300 days left until the start of the run across Europe I decided to step things up last week with an increase in mileage and difficulty. The week got off to an unusual start with what you might call a bit of "high temperature training". 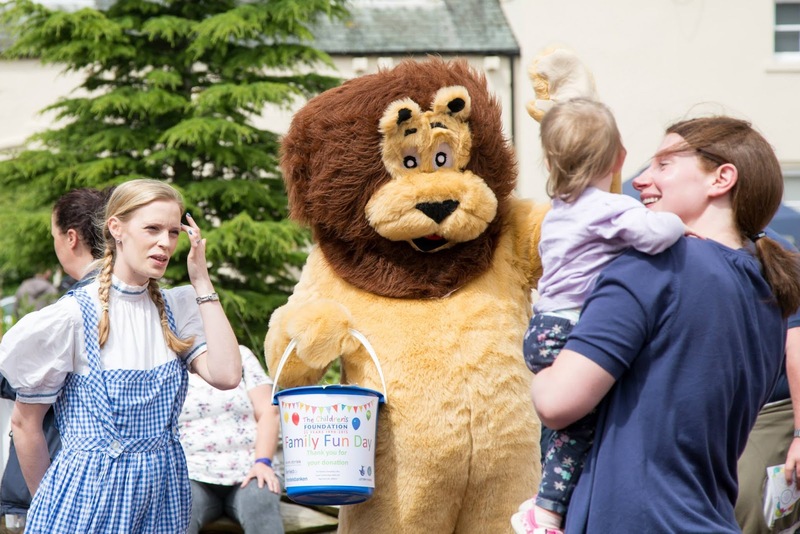 Donna and I reprised our roles as Dorothy and "Courage" the Lion at The Children's Foundation Family Fun Day at Kirkley Hall. We've ran the Great North Run twice in the costumes over recent years. The Fun Day was almost as difficult with lots of hi-fives, fist pumps and pictures taken on a sweltering hot day. We were originally asked to don the costumes and a collection bucket for 30 minutes "here and there" giving a bit of recovery time from the very warm costume. However, the generous attendees kept putting lots of change in our collection bucket and apart from a 10 minute breather we stood for four hours having a lot of fun with children and grown ups alike. With thousands in attendance, the Family Fun Day was a huge success for The Children's Foundation in terms of awareness and fundraising and I believe another event is already in the planning stages for next year. 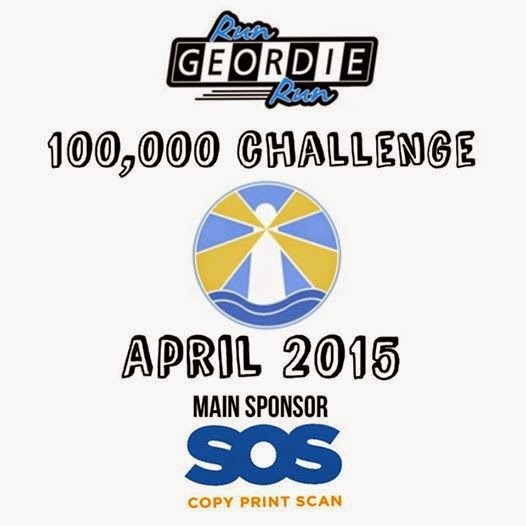 Sadly I'll be running across Europe at the time but look out for a special Run Geordie Run stall. The weeks running got off to a solid start with standard lunchtime runs including a pleasant 8 mile run around Havannah Nature Reserve on a very warm day and a random 10 mile route including Newcastle on what was the warmest July day on record. Both runs were very comfortable and saw me try a product from CherryActive called BeetActive for the first time. This is a drink which, taken an hour or so before exercise, helps to delay the onset of fatigue. It's hard to measure how successful it was as I'm getting fitter every week but I was surprised just how comfortable and consistent both runs were during the week. 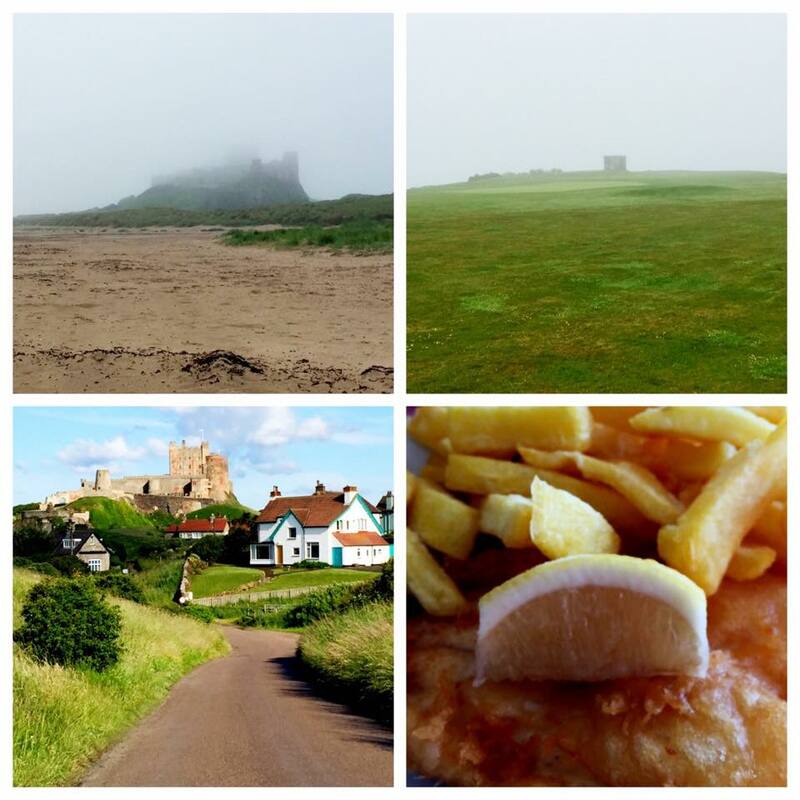 Saturday's plan was to run from Bamburgh to Seahouses and back as many times as I could in an 8 hour period. I left my car at Bamburgh and ran self supported for the entire day. I set off along the beach at 10:30 in horrible wet and windy conditions. There weren't very many people out at all thanks to the weather. To my surprise, I found running past the caravan site where I spent every Summer from the age of 3 to 18 a very emotional experience. I have many happy memories and it just served to spur me on for the rest of the day. Soaked from head to toe, I made it to the "Lookout" at Seahouses golf course in just under an hour via the beach and the harbour pier. Suddenly, my aim for the remainder of the day and to keep things as interesting as possible had become to reach each point in Bamburgh and Seahouses in under an hour. 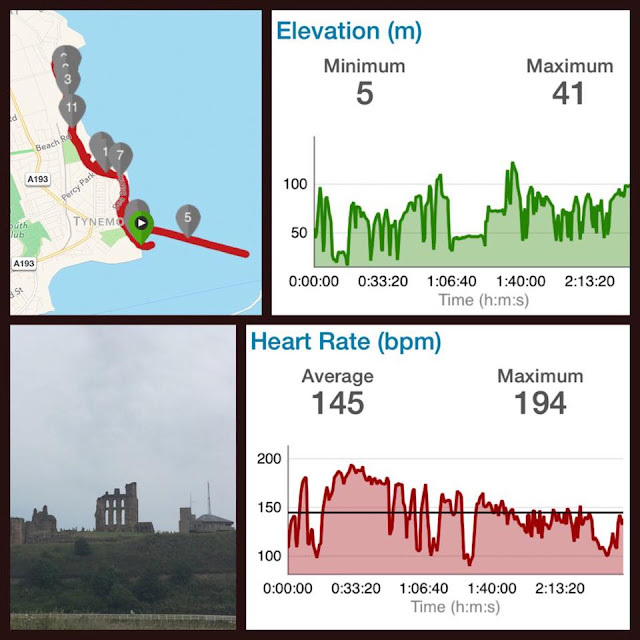 I ran back to the car in Bamburgh along the road in 47 minutes with some decent pace. I bought myself some time to take on some energy food and set off with time to spare from the point of view of getting to each point in under an hour. The 2nd journey back to Seahouses was quicker than the first and took 54 minutes. The journey back to Bamburgh started off quite slowly but miles 15, 16 and 17 got progressively quicker with mile 18 at sub 9 minute mile pace. It's a shame I got back to the car as, despite the now boiling hot sun beating down, I had found a really good rhythm and had plenty of energy. Given that I was only half way though the day having ran for 03:54:00 I decided to have a quick sit down in the car and something to eat. This was a fatal move as I had a tactical snooze for just over an hour. I certainly needed it and many late nights working on the logistics of the run across Europe and early starts in the gym started to tell! After my sleep I ran back to Seahouses in an hour and took the same time to get back to Bamburgh. I decided to call it a day at that point after running 27.5 miles in 07:16:56 (including tactical snooze time!). I hard burned 4200 calories in that time which meant only one thing. Fish and Chips in Seahouses! They were delicious and well earned I thought as this was the longest that I'd ran since day 81 in Australia. Sunday saw very little evidence of the previous day's running in my legs. This was thanks to CherryActive of course. The plan was to attempt to run from the bottom of the bank near the Priory in Tynemouth, up the steps in King Edwards bay, up 4 ramps in Longsands and 2 ramps in Cullercoats bay. I then did the whole thing in reverse back to the bottom of the bank near the Priory while adding in some active recovery along the pier. That 1st "lap" was 6.5 and took just over an hour. The unfortunate thing was that I wasn't just jogging up each ramp, I was sprinting up them. I found it impossible to ignore the challenge of powering up each climb. This wasn't turning into the workout that I'd hoped for and I wasn't keeping anything in reserve at all. I've got to admit that I throughly enjoyed getting onto my forefoot and really letting my arms help to get to the top of each climb. I decided to do each climb twice during the 2nd lap. This was absolutely exhausting and I made good use of the active recovery time between each sprint. I reached the finish line after 12 miles. You can see from the graph above just how many climbs there were. "Stopping after this lap. I've sprinted up every climb so far. Very pleased. This is not an 8 hour or even 3 hour workout just yet." 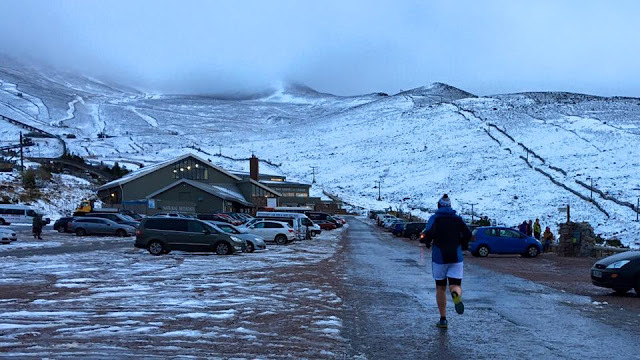 "Brilliant response though after yesterday's very tough session. This has been a real confidence booster for sure." 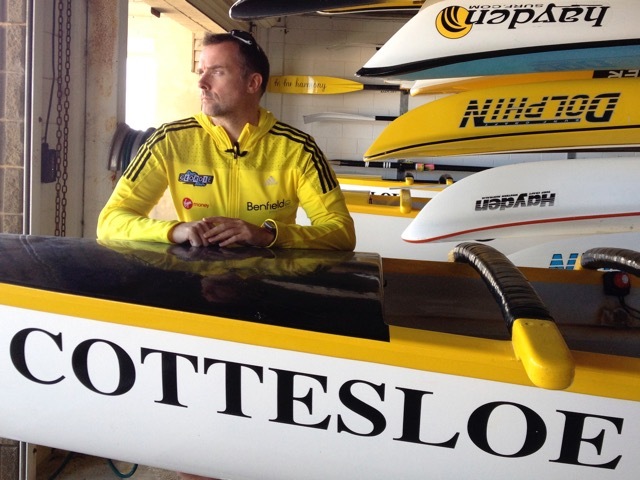 "I'll have a repeat of this weekend in August and try and learn and improve. @cherryactive played a huge part today. No aches from yesterday." "The enthusiasm to run that was missing in the build up to Australia is well and truly back and has been growing well since February." "1300 ft of climbing today over 12 miles. Think all of these stats mean that I've qualified for a Sunday dinner!!" So without doubt this had been the best week of training so far in the build up to the run across Europe. 3 gym sessions and 58 miles of running was very pleasing. This week sees a much lighter schedule with only 30 miles to run and 3 gym sessions. There is a real momentum gathering for the run across Europe. Not just in training but also with the planning side of things. I'll talk more about that later this week. One thing is for sure, all of the planning and prep done over the next 300 days is crucial to the success of the next big run.